Does the former Docker get a bump now that he’s at the Lions? Click here for 2019 Fantasy prices. As a diehard Freo fan, I was personally pretty bummed to see Lachie Neale take his talents to Queensland in the offseason. From a fantasy perspective though, a fresh start gave me hope that his choice to wear Brisbane colours may help take Neale to the next level. Ever since the poxy sub-rule was removed (10 sub-affected scores from 2012-15) Lachie Neale has come into his element as a fantasy player and even though the Dockers have never been an elite fantasy scoring side, he always shone through. Neale was the only Fremantle player to average triple figures in each of the last four seasons, topping their best and fairest count on two occasions. In the first of his two B&F seasons (2016), Neale had a minor fantasy breakout dropping six scores of 130 or more to take his average over 110 and finish the year with the fourth-most fantasy points behind only Patrick Dangerfield, Zach Merrett and Adam Treloar. His elite durability is something else to behold, with Neale appearing in 108 games out of possible 110 in the last five years. In that span, Neale’s averaged over 28 disposals a game a trend I see him continuing for the Lions. While his fantasy averages may look somewhat pedestrian for a gun midfielder, his consistency and durability offers a nice ‘set and forget’ choice. The departure of Dayne Beams only likely strengthens Neale’s case with a young Lions brigade searching for an established midfielder who can get his hands on the pill. Lachie has always been a dominant ball-winner, even through his junior years, which leads me to believe he won’t take a step backwards in Brisbane. Twice in the last three seasons, he has averaged over 30 touches per game and only FOUR times since 2016 Lachie Neale has failed to gather 20 or more touches in a game. Two of those games were in 100-point drubbings (the other two 50+ point L’s) and it’s fair to say, the way Brisbane is trending, you don’t expect them to be on the receiving end of too many hefty defeats in the near future. Getting your hands on the footy isn’t the only way to score a ton of points and you could make the case that Lachie Neale doesn’t have any other elite fantasy traits. His handball happy style of play has put a ceiling on his fantasy scoring to date, with Neale averaging 15 handballs a game for his career. Brisbane could look to deploy him in a more attacking role, but you can’t expect a leopard to completely change its spots. Handballing aside, the rest of Neale’s game isn’t fantasy-friendly either. For his entire 135 game career, Neale has never averaged over five tackles OR five marks a game, again stopping him from taking the step up from great fantasy player to an elite, uber-premium. Neale hasn’t consistently hit the scoreboard either, with just 67 career goals to his name and while there have been a few occasions in which he has kicked multiple snags, you’re more likely to see Dayne Zorko inside 50 over Neale resting in a forward pocket. Another strike against Neale is the Lions’ fantasy scoring in seasons past. While Freo hasn’t been the greatest source of fantasy points, Brisbane is far from a never-ending supply of fantasy tons either with Dayne Beams, Tom Rockliff, Stef Martin and Dayne Zorko the only Lions to average 100 or more in the last four years. You could even make the case that they’re all better fantasy players than Lachie Neale which doesn’t exactly give us hope for a lot of growth in 2019 from Neale. Find The Traders’ podcast on: Apple Podcasts, Google Podcasts and Spotify. 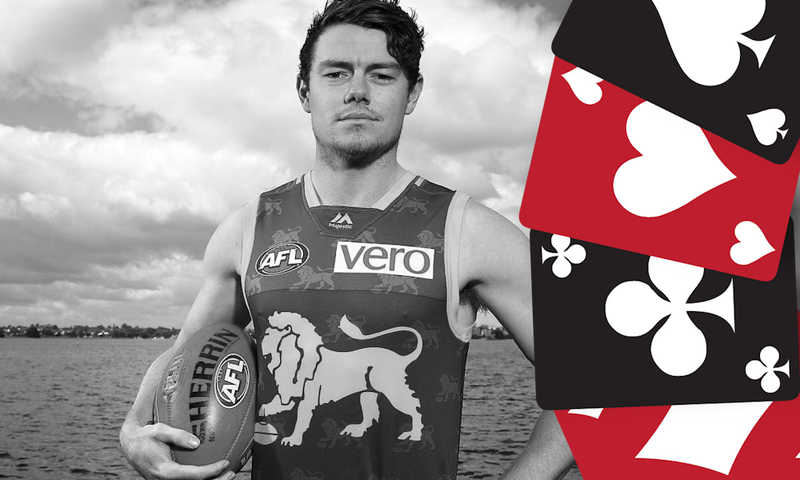 KING – Lachie Neale is what he is from a fantasy perspective, good for an average of 100-105 over 22 games year in, year out. His move out of the WA footy bubble should see a slight increase in his output, however, he isn’t going to completely revolutionise his game under Fagan’s tutelage. It isn’t inconceivable that Neale pushes his average north of 110 once again, but I expect him to just fall short. FOLLOW ME ON TWITTER: @SportsbyFry for all things AFL Fantasy (and more). Got something to say about the deck? Use the hashtag… #DeckofDT. Nice article. I like players who are SuperCoach relevant. Neale is a great selection, but I’m a bit worried with him changing clubs. Who knows how this will affect his role? That’s my mindset as well, he’ll knock on the top-8 door though. Upgrade target? Will he become the No.1 target to tag? Or will that still got to Zorko?